Demonstration of narrowed blood vessels in various projections is of extreme importance. The maximum degree of narrowing can be only appreciated if the lesion is demonstrated in true profile. Significant lesions may be overlook if visualized in face. Coronary artery lesions are frequently eccentric. The image intensifier is to the left of the patient. The spine is to the right of the screen. The image intensifier is to the right of the patient. The spine is on the left of the screen. Cranial angulation is ideal for visualizing the distal portion of vessels. Caudal angulation is ideal for visualizing the proximal portion of vessels. Is looking down the interventricular and interatrial septum plane. 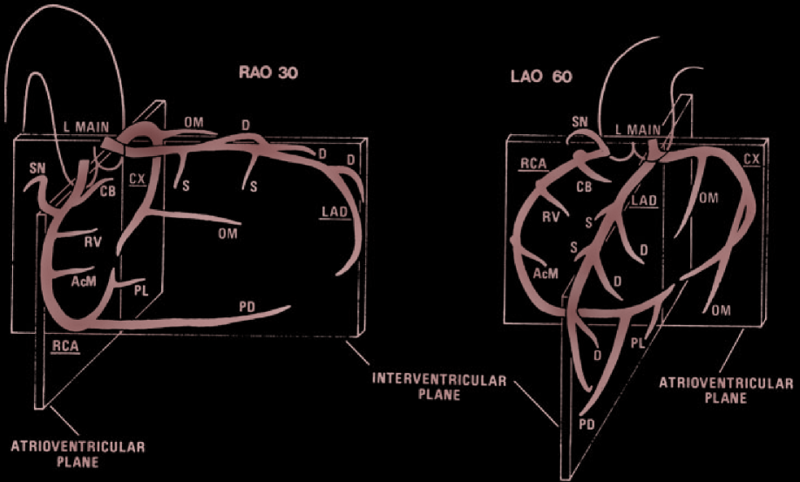 The LAD and PDA are seen coursing vertically in the middle of the cardiac silhouette following the path of the interventricular septum. The interventricular septum plan seen en-face. The two artia and the two ventricles are superimposed. The proximal circumflex and proximal RCA are well visualized as they follow the course of the atrioventricular groove. frontal (posteroanterior, PA), lateral, right anterior oblique (RAO), and left anterior oblique (LAO). In 1981, Paulin proposed that radiographic projections be named by following the course of the X-ray beam as it passes through the heart. The X-ray gantry can be angled in the horizontal and coronal planes. In the “cranial” view, the X-ray beam originates caudally and passes through the heart to the image intensifier, which is angled cranially. Conversely, in a caudal projection, the X-ray tube is angled cranially and projects the X-ray beam caudally to the image tube. The use of multiple oblique views in the anterolateral projections in conjunction with angulation in the caudocranial plane has greatly facilitated optimal visualization of coronary lesions and minimized the problem of foreshortening of the coronary arteries. ​20° RAO–20°caudal view of the left coronary artery. Optimal for LMS and LCX arteries. Optimal for LAD & the entire length of the diagonal branches. In LAO views, the catheter and the spine are to the RIGHT of the heart.